Are you a managed service provider such as a Google Apps Authorized Reseller? Do you have customers who are interested in migration to or from cloud storage? At Nava Solutions, we place a high importance on long lasting quality partnerships. We believe that our products will help you excel in what you do and significantly increase your competitiveness. Our cloud storage migration tool, Nava Certus, allows for seamless migration to and from various forms of cloud storage, such as Google Apps, Amazon S3, and Dropbox. Resell Nava Solutions products to your customers. Ability to generate service revenue by offering to perform migration services. 24×7 email support from Nava Solutions. White label agreements will be considered for Premium partners. 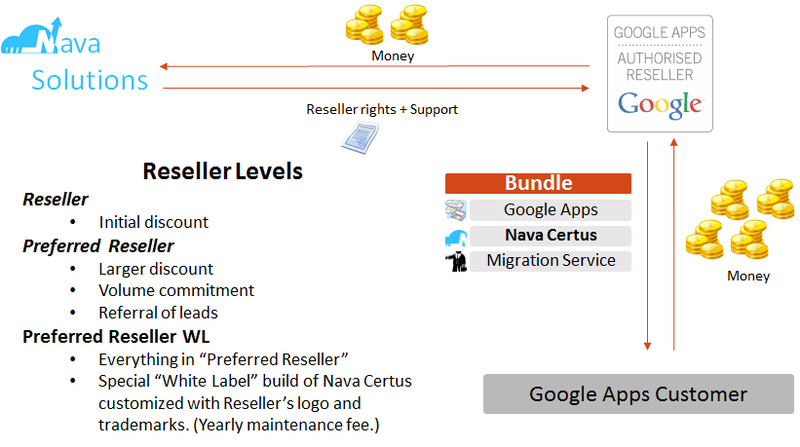 Here is an example how Google Apps partners derive more value by partnering with Nava Solutions.